Amazon.com is providing more bang-for-the-buck with four new Fire tablets, with prices starting as low as US$99 for a Fire HD with a 6-inch screen. The company also announced a 7-inch Fire tablet for $139, and a refreshed 8.9-inch Fire HDX 8.9, which is priced at $379 for a Wi-Fi version and $479 for an LTE version. Amazon has extended its tablet offerings as it tries to offer a range of devices through which customers can buy more products and services from its online store. Amazon already sells the Fire Phone and the Fire TV streaming media player. 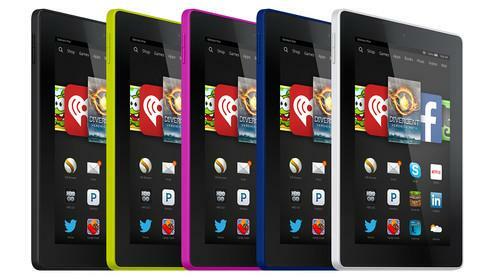 For the low prices, the Fire HD tablets have strong hardware features. The tablets have quad-core processors, and front and rear cameras. The 6-inch screen can display images at 252 pixels-per-inch (ppi), while the 7-inch screen shows images at 216 ppi. Amazon also said the Fire HD tablets provide three times the graphics performance than Samsung's entry-level Galaxy Tab 4 tablets, which have ARM's basic Mali graphics. The Fire HD tablets also have Gorilla Glass displays, which reduces the chances of screens cracking or getting scratches. The rugged screen is typically available on tablets above $200. The budget tablets are available for preorder and will start shipping in October. The Fire HDX -- which weighs 374 grams and delivers 12 hours of battery life -- has Qualcomm's latest Snapdragon 805 processor, which has 70 percent faster graphics than the previous HDX tablet, Amazon said. The Snapdragon 805 operates at a clock speed of 2.5GHz and has an Adreno graphics core capable of rendering images beyond the 1080p high-definition resolution of 1920x1080 pixels. The HDX can display images at 339 pixels-per-inch, and will have a feature that adjusts screen brightness based on ambient light, which can be helpful when reading an e-book. Another new feature is 802.11ac Wi-Fi, which is faster than older Wi-Fi technology on the predecessor tablet. Amazon also introduced the Fire HD Kids Edition, described as the first tablet built from the ground up on the premise that kids want a real tablet, not a toy. With a quad-core processor and HD display, Fire HD Kids Edition is priced at $149 with a 6-inch screen and $189 for the 7-inch version. The Kids Edition comes with a two-year guarantee that Amazon.com will replace the device if it is broken, and includes a year of Amazon FreeTime Unlimited providing kids unlimited and free access to 5,000 books, movies, TV shows, educational apps, and games. Amazon also announced a Fire OS 4 "Sangria," which is based on Android 4.4, codenamed KitKat. Amazon has tuned the new OS for the newer range of Fire devices. The company also introduced the $199 Kindle Voyage e-reader, which Amazon in a statement described as its " thinnest, most advanced Kindle ever, with our brightest, highest resolution, and highest contrast display." Also announced as part of the product refresh was a $79 Kindle, which offers weeks of battery life, more storage and a touch interface.